Star Wars fans launch X-wing flight Jump to media player Two amateur astronomers have launched a model of a Star Wars 'X-wing' vehicle into the stratosphere. The robot that makes coffee Jump to media player BBC Click's LJ Rich looks at some of the best of the week's technology news. Ten years of YouTube videos Jump to media player The first video was uploaded to YouTube ten years ago this week. The vibrating pen fighting Parkinson's Jump to media player Students have created a vibrating pen designed to help patients with Parkinson's disease. 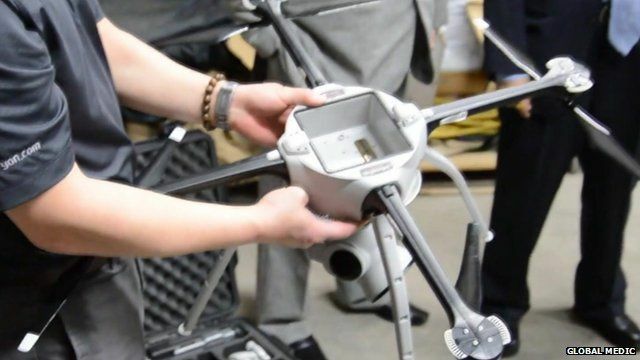 Unmanned aerial vehicles are being used to help aid relief operations in Nepal. The country was hit by 7.8-magnitude quake last week leading to widespread destruction. The charity Global Medic is using the drones to help photograph and map areas affected by the earthquake. It will then pass this information on to aid crews and rescue workers on the ground. BBC Click's Jen Copestake spoke with the director of the charity Rahul Singh to find out more.